Inexplicata-The Journal of Hispanic Ufology: Chile: What the Devil...? Researcher Raúl Nuñez from IIEE-Chile sends us this image from Las Ultimas Noticias, which asks: "What the devil is in this photo?" The text goes on to say: Rosa Araya says that the only thing she did was take a photo of her nephews in the backyard of her house in Montegrande to finish a roll of film. Upon developing the roll, she became aware of two things. She had only focused on the boys' heads and that some strange luminous dots forming a sort of saucer appeared over the skies of Valle de Elqui. 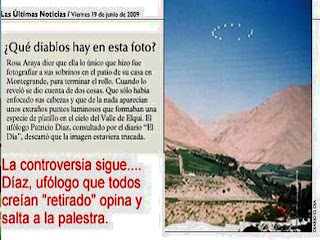 Ufologist Patricio Diaz, when consulted by the "El Dia" newspaper, dismissed the possibility that the image was a hoax. Then, in bold red: "The controversy is afoot. Diaz, a ufologist that everyone believed to have retired, opines and jumps into the fray..."
A number of photo experts will surely opine as well and invoke a number of camera defects capable of producing such an image, but here at Inexplicata, it reminds us powerfully of the "clock" images studied by psychologist Berthold E. Schwarz in the 1970s as part of the Stella Lansing case. Could this be a Chilean equivalent?